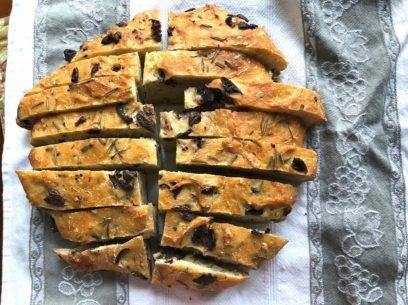 This no-knead, slow-rise, authentically vegan recipe takes five of the most basic ingredients and turns them into heaven. In an effort to reproduce an authentic Greek bread baking method using clay covered bakers, I use a clay bread cloche. These are easy to find and not very expensive and give you the most amazingly crunchy crust! Another option would be a Dutch oven, I’ve used them a few times when baking away from home and the results were wonderful. a light crumb, high rise and full of juicy olives! Below is a bit slower run-down of the above! **Whole wheat or white whole wheat flour are very nice in this recipe too. That said, I do make sure let the dough go a full 10 hours with whole wheat and it gives you a bit more dense finished crumb. In a large bowl, completely combine flour, salt and yeast. Slowly, about a half cup at a time, add water and mix by hand. Continue to add water by half cups until ingredients come together in a rough ball. Add in chopped olives and mix into dough to disperse olives evenly. Cover bowl with a kitchen towel and set aside in a warm place to rise for 8-10 hours. Optional: Prepare you cloche bottom or Dutch oven by sprinkling a teaspoon or so of semolina flour (course or fine) over the bottom surface. When risen, turn the dough out directly onto the cloche bottom or into your Dutch oven. Bake in a preheated 450 degree oven for exactly 1 hour. Uncover and check for doneness – for new bread bakers, use an instant read thermometer. You’re looking for anywhere from 87-93 degree internal bread temperature. More experienced bakers, tap the bottom of the loaf and listen for doneness. Honestly, one hour covered hits the mark every time for me! Love your recipes, thank you for sharing! Made it yesterday! Turned out great! Soft and airy inside with a super crispy crust. I let it rise for about 15h (simply didn’t have time to bake it earlier). I also put my Dutch oven into the cold oven and let it heat up for 30 min before putting the dough. I baked the bread for 45 min with the lid on and then for another 15 min without the lid. No problems with removing the bread from the Dutch oven, perfectly done, beautiful and nicely rustic. Thank you! 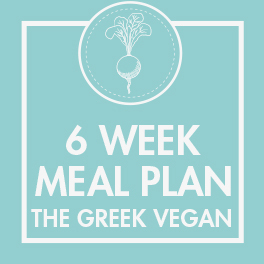 It’s wonderful to finally find a Greek vegan blog! 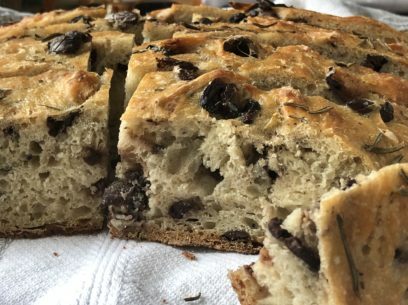 Do I use bread flour ?